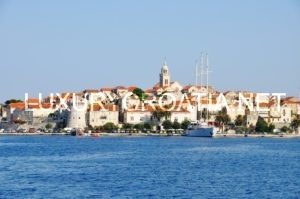 Korcula the island of Marco Polo is one of the most densely wooded islands in the Adriatic. The landscape of the island of Korcula is enriched by olive groves and vineyards which represent a traditional source of life and income for the population of the island of Korcula. Korcula is considered as the pearl of the southern Dalmatia and offers to its visitors picturesque walled old town of Korcula, magnificent coastal panoramas, dreamlike fishing villages and stunning coves.The coast of the island of Korcula is very indented with a large number of bays and coves. It’s north shore is rather low and easily accessible with several natural harbours: Korcula, Banja, Racisce, Vrbovica, Babina and Prigradica. 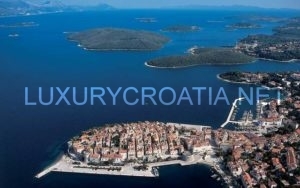 Korcula the island of Marco Polo – The old city is surrounded by walls, and the streets are arranged in a herringbone pattern allowing free circulation of air but protecting against strong winds. The town’s historic attractions include the central Gothic and Renaissance Cathedral of St Mark, the Town Hall and the massive city fortifications. The 15th-century Franciscan monastery with a beautiful cloister is situated on the islet of Badija, near Korčula Town.